… among others! Anyhow, last Sunday, Mother’s Day, these wonderful people brought their current projects to share with each other. I loved it! Margaret’s mother came and brought an oil painting that was so very beautiful it pierced my heart — the way the light shown on the painted leaves over a woman sitting on a bench beside a dirt path … and Josiah read the poetic opening of a play he is writing for a friend who plans to stage it using puppets. Puppets implies children, and so you might assume a simple intro to this play … but it is more Shakespearean than simple. To me, it is beautiful. A serenade sung in the depths. Of my fifteenth year to rise to the world above. My oldest sister left and returned within a month. The peal of church bells, the click and whir of carriage wheels. Clear and clean in the thin night air. To tell us the sun was more than a violet bleed. and a flutter of birds etched black above. having swam the length of an inland river. and scattered when she came near. Chilled and shivering from the cold. Adrift in the current’s flow. Written blank on her face. Tinge shrouded by a fringe of wayward cloud. that bobbed to and fro in the currents of wind. *Thank you, Josiah, for writing something so beautiful that lets us see the Little Mermaid and experience her amazing transition from under the waves to a place above them. Rumi came to me late in life, even though I heard his famous name when I was younger. Once I started reading Rumi, I couldn’t stop because his verses are beautiful, lyrical, and infused with a profound awareness of divine love. Kabir is like that, too, I see now as I read translations of his poetry by Robert Bly. Robert Bly captivated my imagination with one of his many books, this one a collection of poems he’s translated, The Winged Energy of Delight. His skill as a poetic translator is undeniable, and I always find myself deeply enjoying Bly’s deft word choices and flowing lines. His work with Kabir’s poetry is simply marvelous. but I don’t know whose flute it is. A lamp burns and has neither wick nor oil. A lily pad blossoms and is not attached to the bottom! When one flower opens, ordinarily dozens open. and when the next rain will come is all that the rain bird thinks of. The flames, made of snow. I run around looking for the Friend. will I get the lost years back? of a ruin, inches from the treasure! In 1977, Rankin & Bass produced a cartoon version of J.R.R. 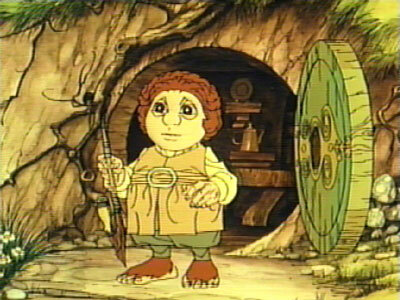 Tolkien’s The Hobbit, which instantly delighted many children all over the world. In the film, after the dwarves, the wizard Gandalf, and the hobbit Bilbo discover a stolen treasure amassed by trolls, Gandalf hands over a map of the Mountain to the dwarf-leader, Thorin Oakenshield. (In the book, Gandalf shares it with Thorin and Bilbo back at Bag End before their adventure ever begins — the story was changed a bit in the translation from the page to the animated performance.) In the Mountain, there is an even greater treasure, one that has been stolen and is being jealously guarded by the dragon, Smaug. It is why the dwarves and Bilbo are on their adventure: they are treasure-seekers.